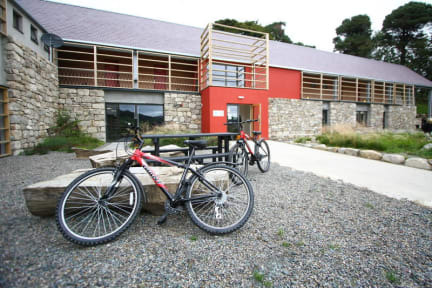 Knockree Hostel (Hostelling International) i Wicklow, Irland : Boka nu! Knockree YH is An Oige's newest Hostel building. It re-opened in April 2008 after a total rebuild. Situated in the spectacular Glencree Valley, along the Wicklow Way route, it boasts spectacular views and a walk along the river. Knockree hostel is located in a fabulous rural setting 7.5km from Enniskerry and 12km from Bray town in the county of Wicklow. It is an ideal location for hillwalkers, lovers of the outdoors and activity-seekers, and makes a great escape from the hustle and bustle of city life. Families and business- people alike enjoy the relaxed, easy-going atmosphere and the scenery that makes Knockree unique. Some bedrooms have views of the amazing scenery that surrounds this hostel, most especially, our Double Deluxe Room is also dubbed 'the Honeymoon Room'. * Hostelling International members receive a 2 discount p.p. per night on arrival on production of a valid membership card. * You are advised to bring your own food as no shops close by and meals facilities currently limited to breakfast. Closest shop Enniskerry, 7km. * We do not accept bookings for more than 10 people. Any such booking will be cancelled and the deposit will not be refunded. * Our 'Family Rooms' will have at least a DOUBLE bed in the form of either: 'Houston' type bunkbed (double bottom, single on top) or a 'regular' Double bed. If you require a 3bed Family, book a 4bed then contact us directly. * Our Double / Twin room COULD have more than 2 beds - but rest assured if you rent a Double/Twin you'll have it to yourselves! All Double/Twins will have at least a Double bed unless otherwise specified. Reception opening hours 08:00 - 21:00, LAST CHECK-INS strictly 9pm! Ring the hostel for late arrivals. And Don't Forget ..we now offer adventure activities in conjunction with Eco Adventure Ireland on our hostel grounds for groups including pony trekking, mountain biking, archery, low ropes, target shooting, team tasks and orienteering. We also offer ecology field study days for schools.